We haven't had a paint-out at Alhambra Park for about four years. My Alhambra Pool watercolor was done there then, four years ago. The park is very close to where I live in South Pasadena and has some nice features as well as interesting surrounding areas. Anyone seeing some of my paintings has probably noticed I like to include utility poles. It turns out that across the street on the east side of the park is the Alhambra section of our main electric power distribution system. 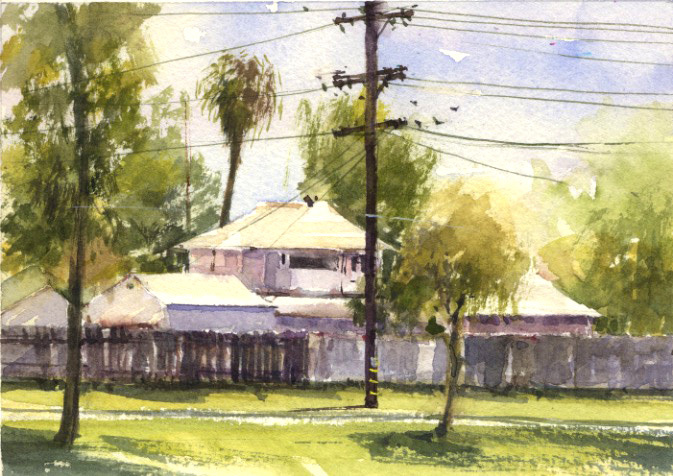 There were some substantial utility poles I hoped to include in my landscape painting. It turned out to be a smaller, quicker watercolor so, only one pole. Always a fun morning painting with friends in the park.